Vultures are scavenging birds of prey. A typical characteristic of most vultures is a bald head, devoid of normal feathers. Vultures are found on all continents except Australia and Antarctica. There are 11 species of vultures in Africa, with the majority listed as endangered, such as the Cape Vulture (Gyps coprotheres), which has already been classified as extinct in Namibia, Swaziland and Zimbabwe. Vultures clear up to 70% of Africa’s carrion and are extremely beneficial to humans, considerably reducing the spread of diseases, some of which can be fatal. In 2015, several species of vulture were ‘uplisted’ based on their rate of decline, resulting in several species being classified as endangered or critically endangered (such as the white-backed and hooded vultures). The endangered Cape Vulture population is declining throughout much of its range, with an estimated 4,700 pairs remaining. Vultures require a habitat that allows them to see or smell carrion while they soar in the sky. This usually includes savannah or plains, though some live in open mountain regions. The Cape Vulture usually breeds and roosts on cliff faces, where it can fly long distances in search of the large animal carcasses on which it specialises. Although vultures are classified as birds of prey, they rarely kill other animals and are almost exclusively carrion eaters. Vultures usually feed in large groups, often with other vulture species, each having their own individual role in the feeding. Vultures are vital for keeping the natural world in balance as they clear bodies that would otherwise rot and attract insects, that in turn transmit diseases to both livestock and humans. 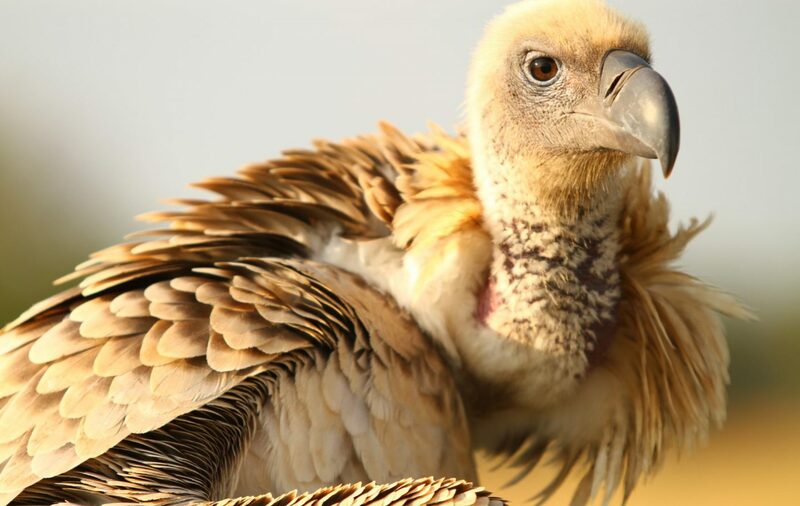 Vultures are facing several threats, making their conservation a difficult task. Poisoning incidences are being regularly reported due to poison being left for pests, poachers lacing elephant or rhino carcasses to intentionally kill vultures (a single poisoned elephant carcass can result in hundreds of vulture’s deaths, wiping out an entire colony or local population), and anti-inflammatory drugs, used for livestock, which is lethal when ingested by vultures. In South Africa, power line electrocutions and collisions are the most prolific threats to vultures. Superstitious beliefs create a demand for the poaching of vultures and their parts, especially the head and feet. A variety of conservation measures are required to protect vultures, including efforts to stop the use of toxic anti-inflammatory drugs, lobbying for changes to the structure of power lines to prevent electrocution, and raising awareness to change the image and prevent the persecution of these much-maligned birds. For the last nine years, Tusk has been supporting VulPro, the only vulture breeding facility in Africa committed to releasing offspring into the wild.